Our current art exhibit features new work from 13 Gallery Northwest artists. The artwork includes pottery and paintings in oils, acrylics, watercolors and pastels. The pieces are for sale; proceeds benefit the artists and ECEC’s art programs. 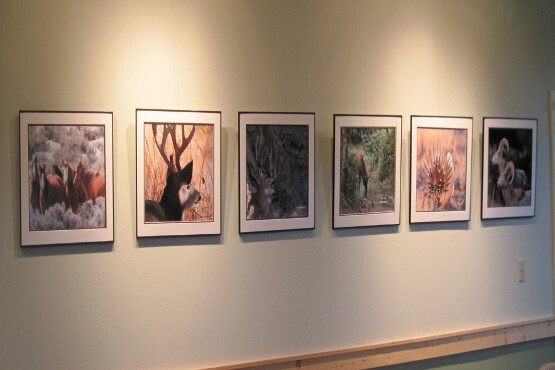 The ECEC Art Gallery is located in the Library / Community Building and presents a new show four times a year. Exhibits are curated by local artists Joan Arsenault and Marsha Mello. Take a walk through the gardens and Native Plant Park to discover whimsical creations and permanent art installations. The centerpiece is a set of three 24′ high decorative cast iron grills depicting evergreen forests by internationally known artist Jan Zach (pictured above). The grills were commissioned in 1960 and originally installed on the Equitable Savings and Loan Building in Roseburg). Other highlights include a stunning stone fountain by Lincoln Russel of BR Nursery and recent works by metal artist Phil Beck.